There's a new baby on the way, and mommy and daddy chipmunk have so much to do! 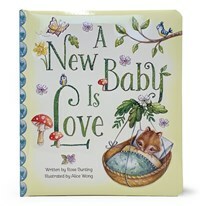 This cozy, padded storybook explores the excitement of preparing for a new baby and highlights the patience needed to wait for them to arrive. With beautiful illustrations and a sweet sentiment, new parents and families with small children alike will adore this keepsake for years to come. Sure to be a family treasure, this book makes an excellent gift for expecting parents or siblings. Celebrate and wait for the new baby with this sweet story. Reinforce the concept of unconditional love with your little one by exploring how much love and preparation you gave before they were even born. Our padded Love You Always collection emphasizes emotional development and together time. Reading together helps your toddler build communication skills. Rose Bunting is a pen name for the creative team at Cottage Door Press. We use a name like this when we work together on a story. We choose a name that stands for "red bird," which is our cheerful little mascot.